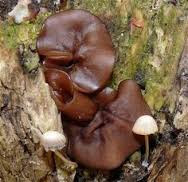 Ear fungus (Auricularia auricula) is a type of fungus that is derived from the species A. auricula-judae and comes from a family auriculariaceae. he called a mushroom because of its menyeruapai human ears or ears. In Japanese society, this fungus known as kikurage, the Chinese community is called Mu Er, are in English mushroom called the Jews Ear / Judas'Ear. In a fresh state, it has tekstrur chewy. Meanwhile, if in the dry state, this fungus has tekstrur hard as bone. The shape resembles a bowl, and sometimes looks like an ear lobe. Has a diameter of 2 to 15 cm with a thin and chewy meat. Has a black, dark brown, or dark brown. The process of vegetative reproduction in fungi is through to germinate, conidia, and fragmentation of the mycelium. While generative reproduction takes place by using a tool commonly called a basidium to produce spores called basidiospores. Life cycle is similar to the life cycle of the oyster and shitake mushrooms, which produces spores in large numbers, it is small and light during fruiting bodies are aging. Mushroom is one type of food that is very good is consumed by people who already have old age. Polysaccharide extract contained in mushroom is able to demonstrate inhibitory activity against one of the key enzymes involved in Alzheimer penyalit. Polarisakarida extract contained in the health benefits of mushroom is able to demonstrate the anti-inflammatory properties. It is useful to overcome or treat irritation and inflammation of the mucous membranes. Polysaccharide extract contained in mushroom is believed to inhibit platelet aggregation and increases clotting time in vitro and in vivo. Anti-coagulant activity occurs because the catalysis of thrombin inhibition by antithrombin not by heparin cofactor. In a study conducted on mice who were suffering from hyperlipidemia. Research has shown that the compound polarisakarida contained in mushroom can lower blood cholesterol (TC), triglycerides and LDL. It can also increase HDL in the blood in these animals. Iron is a mineral that is essential in the process of production of blood cells is to produce a number of proteins in the body such as hemoglobin and myoglobin. This protein will carry oxygen throughout the body. Lack of iron in the body can lead to anemia, which is usually characterized by symptoms such as fatigue, weakness and dizziness. Recommended iron intake for adult men and women over the age of 51 is 8 milligrams per day, and for adult women under 50 years recommended by +/- 18 milligrams per day. Each serving of 99 grams of mushroom can meet the needs of iron in the body until it reaches 3% per day. Vitamin B-2, known as riboflavin contained in the benefit of mushroom can help support the immune system and increase the body's ability to avoid stress. A person's body also needs riboflavin to help convert carbohydrates into glucose which will act as a fuel in the body. This compound also helps maintain healthy hair, skin, eyes, and liver function. Vitamin B2 (riboflavin) in mushroom is also able to act as an antioxidant that can protect the body from the damaging effects of free radicals that can cause premature aging or increase a person's risk for cancer and heart disease. Stroke and heart disease is a disease caused by blood clots that would eventually lead to blockage of blood flow to the heart and to the brain. Mushroom that has been boiled can help reduce the risk of this disease by helping the blood dilution as well as to balance the blood in the body. Mushroom is able to decipher the dead wood from the trees that became a place of life, he will leave the nutrients in the soil, so that other plants can take the nutrients for growth and profits. In addition, during the process of decay, mold releases carbon dioxide used by plants to produce their food. Some scientific evidence can be shown that the benefits of mushroom has the power of drugs that are very effective in lowering cholesterol levels and blood glucose levels. Hypercholesterolemia effect this fungus could be the reason why this plant is said to be able to treat an obstruction in the arteries and veins, vascular sclerosis and hypertension. Someone who has high cholesterol levels in the blood stream can cause excess cholesterol in the arteries and veins and can cause atherosclerosis and obstruction of blood vessels and arteries. One of the causes of hypertension is a narrowing of the renal artery and to reduce the levels of cholesterol in some way, then the possibility of narrowing can be postponed.